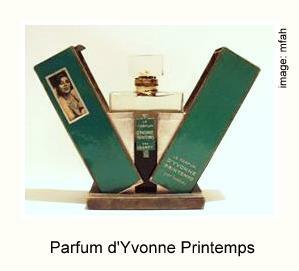 Le Parfum d'Yvonne Printemps by Isabey: launched in 1929. Named after the beautiful actress and wife of noted actor and playwright Sacha Guitry, who Isabey also made a fragrance for. Although in the book Femmes de Papier, the author has noted that Jean Desprez (creator of the famous Bal a Versailles perfume) was the regular perfumer for Sacha Guitry. Simple square shape in clear glass, with flat, square clear glass stopper, housed in a green presentation box.